Any reasonably fertile well-drained soil. Light frost improves flavor, but can be damaged by hard freezes. Sow seeds in rows in spring, and use roots in salads. Grow a second crop in fall, and use both roots and greens in cooking. Keep watered in dry weather. Pick individual leaves for cooking greens, or pull whole plants to harvest roots. 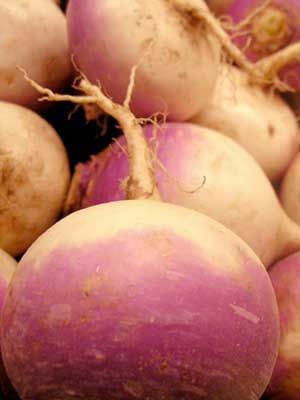 Fall-grown turnips can be stored in a cool root cellar for several weeks. Spring crops bolt to seed quickly, so pull them when the roots are perfect.